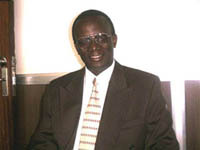 William Muwonge, "Nsibambi Opts Out ," New Vision, 26 September 2003, (Kampala, Uganda). Uganda Chess Federation chairman Daniel Nsibambi will not seek re-election at the body's general assembly at 9:00am on Saturday. Nsibambi will bow out at Lugogo, after serving a two-year term. He is constitutionally barred from standing for another term. Nsibambi took over from Cyril Rwabushenyi and ensured the promotion of chess among the youths.